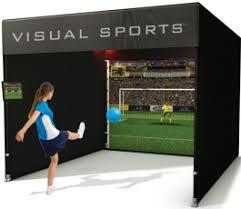 VS-10 Virtual Sports Simulator - Just like the ones you see at sporting events, arcades and sports bars, that we can now bring to you! Includes: 10' x 10' tent with sidewalls, computer, software, sports game accessories, LCD projector, projection screen, and 1 attendant. Requires: Electricity (110-volt, 20-amps), and 1 table.